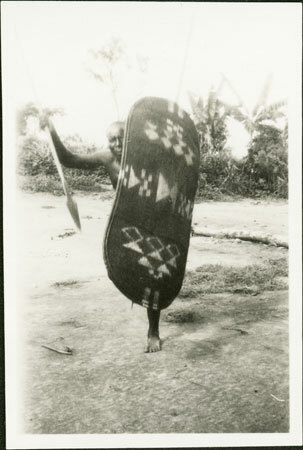 Male warrior (identified in [1998.341.311] as Kuagbiaru) demonstrating the use of a wickerwork shield (kube), coming towards the camera with a raised spear. Although the use of shields was illegal under British adminstration, Evans-Pritchard had several examples made for him by those who still knew the craft. Notes on card mount m/s pencil - "SS fading 5/89 EE"
(E.E. Evans-Pritchard, The Azande (1971: 259 - 261) "A battle consisted of individual combats between warriors on either side all along the line and at short range, usually only a few yards separated the combatants, for the spear had to pierce a man's shield before it could pierce the man. The throwing-knife doubtless carried further, though it may not have been so effective a weapon because it probably met with greater resistance from the texture of the shield. I fancy that its effect was as much psychological as physical. I used to practise with it when I was among the Azande and I learnt to throw it with considerable force and accuracy. When correctly thrown, one of its several blades was certain to strike the objective squarely, and the sight of the blades circling towards one in the air must have been frightening. The Zande shield, however, protected two-thirds of the body, and when a man crouched behind it, as he did if a spear or knife was aimed high, his body was fully covered. If the missile came at him low, he jumped in the air with remarkable agility to let it pass under him. I have not, of course, myself seen a Zande battle, but men have demonstrated to me with old shields or ones I had made for me, how they moved in fighting, and it was a most impressive display in the art of self-defence, in the movements of the body to give the fullest protection of the shield, and in the manipulation of the shield to take the spear or throwing-knife obliquely. The hurling of weapons and the taking of them on the shield were accompanied by shouting the names of the kings of the parties involved. When the combatants had exhausted most of their weapons they withdrew to a safe distance where they challenged and insulted each other, as Schweinfurth noted was customary." See also (E.E. Evans-Pritchard, Witchcraft, Oracles and Magic among the Azande (1972 : 437) "Although shields are no longer made, having been forbidden many years ago by the Government, there are still a number of experts who know the art. One of them made some specimens for me to take back to England..." Further information is available on the Shields and Objects, Anthropology and Museums website at: http://projects.prm.ox.ac.uk/kent/, a collaborative research project between the PRM and the University of Kent. Morton, Chris. "Zande warrior with shield" Southern Sudan Project (in development). 03 Jan. 2006. Pitt Rivers Museum. <http://southernsudan.prm.ox.ac.uk/details/1998.341.245.2/>.